Moist and balanced in flavour, these sweet-but-not-too-sweet chocolate donuts beg to be downed with a glass of milk (non-dairy in my case). As an afternoon or evening snack, or for breakfast, these mini donuts happily accept a variety of finishing touches. Top them with chocolate ganache and coconut or ganache and chopped nuts, or simply dip them in granulated sugar. Chocolate cravings can thus be swiftly satisfied. Combine coconut milk with vinegar. Let stand for five minutes. In a separate mixing bowl, blend dry ingredients together with a fork or whisk. Add eggs, vanilla, and oil to coconut milk. Whisk together until smooth. Add mashed bananas and blend together. Combine wet and dry ingredients until a chocolate batter forms. Preheat oven to 350 degrees F (180 C). 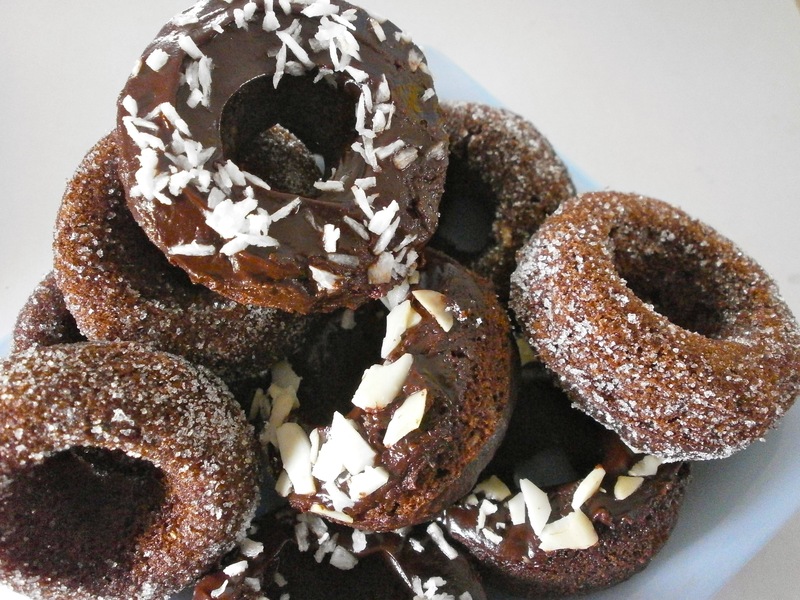 Grease a mini-donut pan with margarine or oil. Carefully pour batter into donut moulds. Bake for about 10 minutes, until a toothpick comes out clean. Cool in the pan for several minutes. Carefully remove donuts when slightly warm or completely cool. 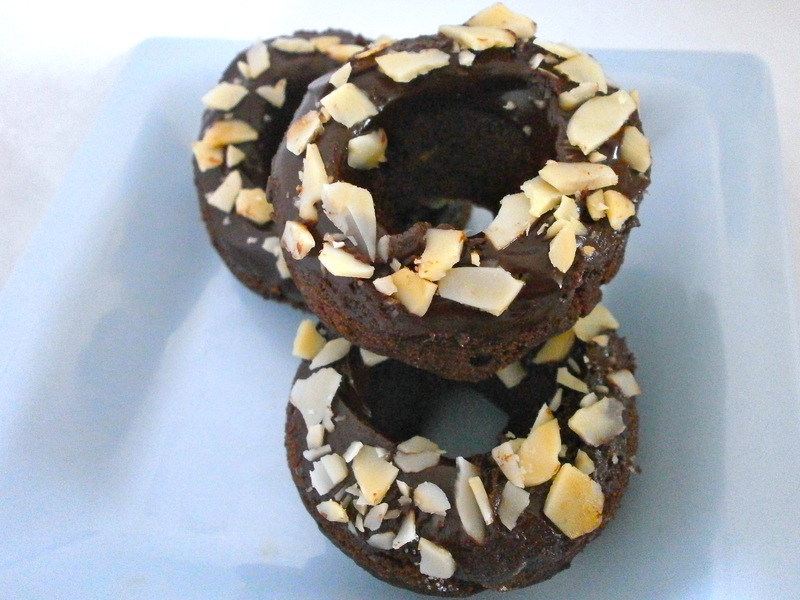 Cover with plastic wrap or place in a sealed container to keep moist until ready to frost with chocolate ganache, or dip donuts in sugar until evenly coated. This recipe is linked to Tuesday Talent Show at Chef in Training. these look amazing! Have never cooked anything sweet with coconut milk but am def going to try these. Coconut milk works pretty well in most things I bake, though it is not quite the same as dairy milk. In the case of muffins and donuts, I usually like it better since they aren’t as dense after baking. Thanks for letting me know about the link party. I’ll try to link something up this week. Your blog looks like a fun place to be! These look so good! I love that they are dairy free. Pinned! My kids (2 & 4 years old) have recently discovered donuts. They would be thrilled if I made some for them- maybe this weekend! Thanks for sharing at Saturday Dishes! Your doughnuts look so delicious. I love that you used coconut milk. I would have never thought to use it. I pinned it! Thanks for stopping by Saturday Dishes and linking up. I love coconut milk because it has a great flavor and it’s dairy free. Other milk alternatives don’t work nearly as well for baking. Even for those who don’t have to avoid dairy, coconut milk is delicious! Thanks! It’s nice to be able indulge in something that tastes delicious with wholesome ingredients. These are so pretty and I bet they taste great too!! I love chocolate donuts. Thanks for sharing at Saturday Dishes.